A home's supply and return ducts are designed to be in balance, meaning that the amount of air supplied to the home is the same as the amount returned to the air handler, and the pressure inside the house is neutral. If either the supply or return ducts have air leaks, this balance is disrupted, and the entire house pressure can be skewed (unbalanced air flow.) Studies show this pressure "imbalance" can increase Infiltration up to 200% when the forced-air system operates. Most homes have leaks in the return ducts. Since most return ducts are located outside of the conditioned space (in a crawl-space, basement, or attic) these leaks draw in outside air. This excess air increases the pressure in the home which forces conditioned air outside through cracks. The outside air drawn into the return ducts is hotter in summer and colder in winter than room air, so comfort drops and energy costs rise. Even when return ducts are located inside the house, they can draw in outside air. 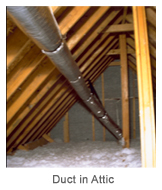 Often these ducts are hidden from view and not sealed inside of the wall, floor, or ceiling cavities. If the supply ducts leak, then conditioned air is lost to the outside. Supply leaks create a negative pressure in the building which draws in outside air. This air can be unhealthy and increases energy and moisture problems. Homes usually have a combination of supply-and-return leaks, as well as other duct problems. As a result, one area of the home may have a positive pressure while another has a negative pressure. While pressure imbalances inside a home are bad, partially correcting duct leakage can also pose a risk. For example, equal supply-and-return leaks can balance each other, such that the pressure in a home remains neutral. Sealing only some of the leaks can create a pressure imbalance. Of particular concern to human health is the quality of air drawn into the building by a leaky return duct. If a return duct leak is near a flue or chimney, it can draw combustion by-products into the house. Fixing return leaks without sealing supply leaks can also create an unsafe pressure imbalance. The best course is to ensure that both supply and return leaks are sealed, and that the pressure inside the house is neutral.